Have symptoms of a urinary tract infection? The symptoms of a urinary tract infection (UTI) can affect any part of the urinary disposal tract including the kidneys, the ureters (tubes that drain from the kidney into the bladder), the bladder and the urethra, a tube that directs urine out of the body. An infection of the upper urinary tract – the kidneys and ureters -is considered more serious than an infection of the bladder and urethra. 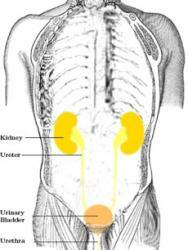 Symptoms of a urinary tract infection that involves the kidneys can include fever, chills, nausea and vomiting. If you see blood in your urine, get to a medical professional immediately. FastMed is open 365 days a year – drop by the FastMed medical clinic closest to you – no appointment required. Urinary tract infections account for more than 7 million visits to medical offices and hospitals each year in America. UTIs are much more frequent in girls and women – roughly 40% of women will have symptoms of a urinary tract infection at some point in her life. Though urinary tract infections are more prevalent in adults, childhood urinary tract infections are fairly common and are generally caused by bacteria. It’s suggested that immediate care be sought to prevent the infection from spreading further along the urinary tract. It is standard practice to prescribe antibiotics that will easily remedy the symptoms and rid the body of the infection. FastMed Urgent Care is nearby and on-hand to treat symptoms of a urinary tract infection. Frequent and recurring urinary tract infections could be an indicator of a more serious condition, particularly if your kidneys are involved. Complicated infections are those that can spread to other parts of the body, are resistant to antibiotics or are worsened due to other medical conditions, especially those that affect the immune system. If you have any concerns, drop by FastMed Urgent Care and talk it over with a medical professional.